Daily soft contact lenses are the most convenient type of contact lens on the market - wear them once and throw them away. However, there has always been a problem with daily lenses - the cost. We felt that customers should not have to pay a high price for the convenience of daily lenses, so we searched the market to bring you a great daily soft lens at low cost. Each box contains 30 soft contact lenses each with a light blue handling tint in a buffered sterile saline solution. Material: Etafilcon A 42%, Water Content 58%. New: We have introduced a new daily lens for dry eyes and even more comfort - Crystal Aqua Daily, at a promotional limited offer price of only £5.99 / 30 lenses. Try them out at this price while stocks last. I have been wearing the Crystal Dailies for a couple of years and really like them ( I have worn contact lenses for 30 years and have tried all types!) 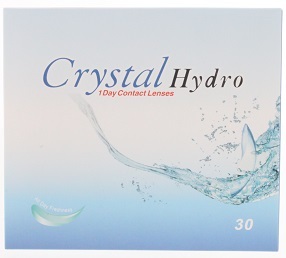 I thought I would give the Crystal Hydro a try to see if they retained moisture better but I really didn't like them, my eyes were red and dry wearing them - the Crystal Dailies are far superior in my opinion. I have gone from wearing monthly to daily contact lenses recently due to the discomfort I was experiencing during the last couple of weeks of wearing a monthly pair of lenses. I tried various more expensive brands of daily contact lenses, some of which would split in my eye during the day (not impressed with that!) I tried these crystal hydro lenses as a last resort thinking I had nothing to loose - best contact lense decision of my life. Easy to put in the eye, none have split or blur during the day and I would recommend these lenses. Also the service from contactlenses.co.uk has been second to none. Brilliant - and my expenditure for daily contact lenses has gone from �49 a month to just �18! Firstly I'm very pleased with the very quick delivery. I ordered my lenses yesterday at 1 o'clock. And they arrived today. Very speedy. First thought was how the packaging looked very much like acuvuve moist lenses I have been using for the past 2 years, but as every one can agree they are getting very expensive. They are easyer to tear off too. I was thinking they would be a floppy flimsy lense. But are very much like acuvuve ones. So far I'm happy and think they are great value for money! Great lens at great value - no complaints! I've worn these lenses daily for several years now and am still 100% happy with them. I can get quite dry eyes but these lenses are still comfortable at the end of the day, and at that price (less than half the cost of my previous brand of lenses) even on the rare occasions where I do need to change them I don't need to think about my wallet! I have tried a variety of contacts varying in price, but these are the best ones i have found! I struggle with dry eyes whilst wearing lenses but I cannot even feel these ones whilst wearing them. Cant believe how amazing these lenses are!! Never write reviews but need to let people know how fantastic these lenses are. I have never been able to wear contact lenses for very long and have to buy an expensive lens from a high street optician which costs me £45 per month, even then im lucky if I get six hours without drops etc. I tried these and they are fantastic I have worn them for up to 12 hours so far with no problem at all, can believe them for the price and I have finally found something I can wear after all these years!!! Thank you so much! PLEASE DONT DISCONTINUE THEM EVER!! If you proceed with the order, we will replace Crystal Hydro Daily with Soflens Daily Disposables, which is a very similar lens, at no extra charge.